Some cars exist simply for functional transportation. The 2018 Mazda MX-5 Miata is not one of them. The MX-5 Miata is built for pleasure. It’s a two-seat sports car that has been in a class of its own for decades, and the 2018 MX-5 Miata continues that trend. Behind the wheel of the 2018 MX-5, you’ll experience the thrill of the road; a renewed passion for driving. And in Nova Scotia, you’ll find the 2018 Mazda MX-5 Miata for sale at Yarmouth Mazda. Every trim level has something new for the 2018 MX-5 Miata. · The MX-5 Miata GX now includes Advanced Blind Spot Monitoring, Rear Cross Traffic Alert, and Advanced keyless entry. · The 2018 MX-5 Miata GS features heated seats and heated outside mirrors. · GT trims include an available Dark Cherry convertible roof colour and Nappa leather-trimmed seats as optional. As well, a limited-production 50th Anniversary Edition has been added for the 2018 model year. It includes a 9-speaker Bose premium sound system with AudioPilot 2 and 17-inch BBS forged alloy wheels in a dark finish. Every 2018 Mazda MX-5 Miata is undergirded by the same powertrain. It’s a 2.0-liter SKYACTIV-G DOHC 4-cylinder that makes 155 horsepower and 148 lb.-ft. of torque. Not impressed? With an extremely low curb weight of 1,078kg, its horsepower-to-weight ratio is among the best in its class. There’s no comparison in on-road handling. 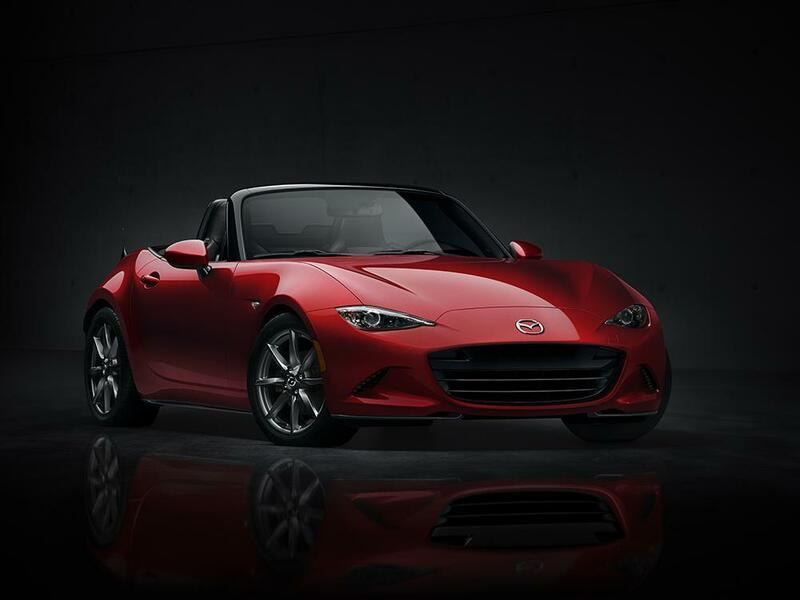 The Mazda MX-5 Miata has near 50-50 weight distribution that includes a driver’s approximate weight. For 2018, the electric power steering has been fine-tuned for better road feel also. Want a more in-touch drive? The 2018 Mazda MX-5 Miata offers either a 6-speed automatic transmission or a 6-speed manual gearbox for those who want to row their own gears. While the MX-5 Miata is focuses on the drive, there’s no harm in adding a few bells and whistles. Standard-equipment features include push-button start, steering wheel-mounted audio and Bluetooth controls, and air conditioning. · A MAZDA CONNECT infotainment system with a 7-inch colour touchscreen display. · A 9-speaker Bose premium audio system with AudioPilot 2. 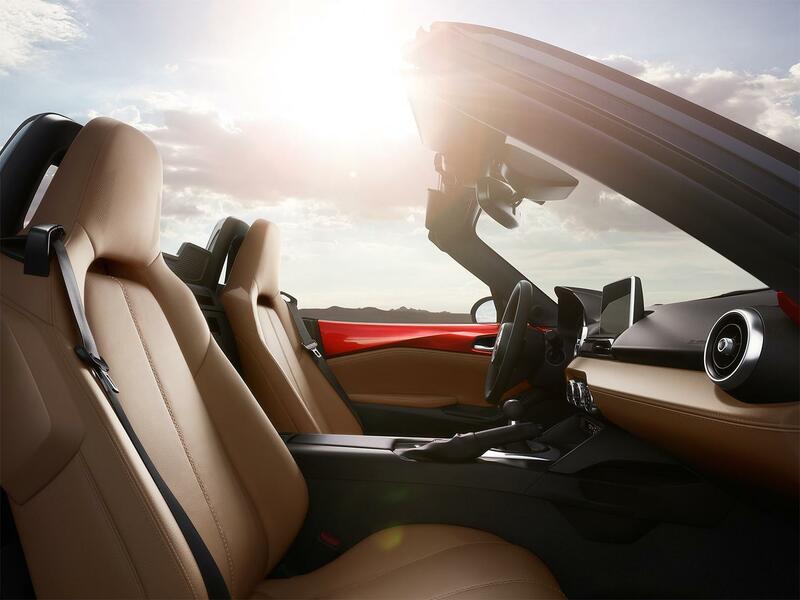 · Heated front seats wrapped in tan or Nappa leather. There’s no question that the 2018 Mazda MX-5 Miata has got ‘the looks’. From the front, the low-slung soft-top gives a mischievous stare through LED headlights. The accented yet simple curves along the body are attractive an engaging. It’s poised like a thoroughbred horse ready to sprint from the starting gate. The convertible top, available in either black or Dark Cherry, opens quickly and brings the true driving experience. The 2018 Mazda MX-5 Miata is built for open-air driving. There’s nothing quite like it. The Mazda MX-5 Miata is a uniquely driver-centric two-seater that’s designed specifically for driving enjoyment. Experience the 2018 MX-5 Miata for yourself at Yarmouth Mazda, your Maritimes Mazda dealer.